The mentoring program of women in ip e.V. is aimed at women who are interested in a profession in the field of intellectual property, as well as at women who have already decided on a profession in this field and are looking at changing their orientation. women in ip brings together mentors and mentees in a tandem for the duration of twelve months. The mentorship begins with a kick-off event where all the tandems take part. This event simultaneously forms the closing ceremony of the previous mentoring programme and thus facilitates the exchange of experience between the various years of the mentoring programme. 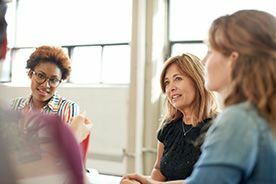 Mentoring is made available exclusively for members of women in ip. It is associated with a cost contribution of EUR 180 for the mentee (reduced to EUR 100 for legal trainees/candidates). The mentor possesses many years of professional experience in intellectual property. In dialogue with your mentor you will learn to better assess your own abilities and receive support in developing them further. A trustful exchange offers the opportunity to reflect on weaknesses and difficult situations. You will learn how to deal with them better and to work out solutions and useful strategies. The support of the mentor strengthens the self-confidence in one’s own abilities. You will train a wide range of both social as well as work-related skills, for example communication skills, self-management, conflict management and team competence. Expand your “informal” knowledge of structures, rules, strategies, and useful tips and tricks for everyday professional life. Due to the great demand on part of the young professionals, we are always looking for women who have professional experience in the field of intellectual property and would like to share their knowledge and pass on their valuable experience as a mentor.